“But I don’t want to go among the mad people,” Alice remarked. Nora ran, dodging trees and paying no mind to the twigs that scraped her bare arms and legs from shoulder to thigh. Once in awhile, the high afternoon sun shone through the density of the woods, and she knew she had better hurry. When she reached the beach, she admired all her sisters who had gathered for the festivities. The continuous breeze carried the ocean’s scent as it waved through her long, bright hair. She felt powerful and had no doubt that she would be the victor. Considering her competition’s bronzed, muscular legs and stomach, Nora found her to be an equal opponent. She couldn’t recall her name, only that they had known each other for a very long time. Nora smiled, and the woman smiled back, but with more self-assuredness—like it was clear she’d leave Nora in the dust. Nora took off. Her legs were strong and her mind clear. She wanted to win, although she didn’t want the race to end. Her sisters raised their red-ribbon-tied spears and cheered. The further Nora ran, the thicker the sand gathered on her feet, but it didn’t stop her from crossing the finish line first. She took small, effortless breaths as she looked behind her, but her opponent wasn’t there. Where did she go? What did she look like? She wondered this as her sisters picked her up on their shoulders and paraded her around. The moon, blazing orange, seemed to take the sun’s place in an instant. Everyone had gathered for the feast, eager and hungry for it to begin. The fire felt hot against Nora’s face and hands. She wasn’t hungry, but she couldn’t wait for the food. A bird with antlers flew down beside her and pecked the ground and then flew away again. She watched as a wolf walked out of the forest. He stopped and then began to spin, around and around, in circles. No one else seemed to notice him until he sat down beside the fire. He was hungry. Mother Mabel threw him a crumb and told him to leave. He growled out of the side of his mouth but ran back into the woods. “Nora,” Mother Mabel said, the fire’s light dancing on her face. “If you feed a wolf, it will leave.” She took a puff from her brass pipe and passed it to the sister sitting next to her. When awoken by a sudden light and an uneasy rustling, she couldn’t recall ever going to sleep. She was afraid to look, but curiosity forced her eyes to fly open. Where am I? Like lyrics to a forgotten song, but without the sweet melody, she vaguely recognized the room. She couldn’t breathe; the four white walls were stifling. Other people were there, but she didn’t know them. What did Mother Mabel say to me? “Something about a journey,” Nora whispered. “What kind of journey is this?” Nora whispered. She tried to stand, but her legs held no strength, and she fell to the hard, cold floor. “Oh,” Mabel said. “Are you hurt?” Mabel tried to help her, but Nora refused, thinking she didn’t need help. “Right.” Mabel bit her nails. The man held his hand out, now helping Mabel stand up. Nora looked at the two little pills in the bottom of the small clear cup. Nora couldn’t see the value of her journey. She didn’t know why she had come to the colorless place where she had to be so weak and helpless and where her thoughts were foggy. “If you feed a wolf, it will leave.” As she looked down at the little white pills, the message the real Mother Mabel had given her became clear. In this strange place, she was the wolf. If she wanted to go back to be with her sisters and never leave the beach, she would have to feed the wolf the little white pills. 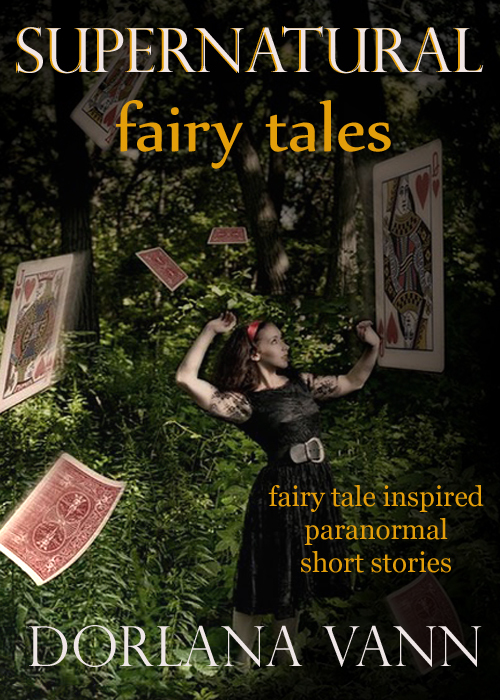 If You Feed a Wolf is one of the paranormal short stories in my collection: Supernatural Fairy Tales – This is one of my favorites because it was experimental. I just let myself be free to write without a real plan. As far as what I took from the original story: it reminded me of how I feel in dreams – and some of the things that happen in this story are taken from my actual dream journal. ← What’s in a (Character) Name?